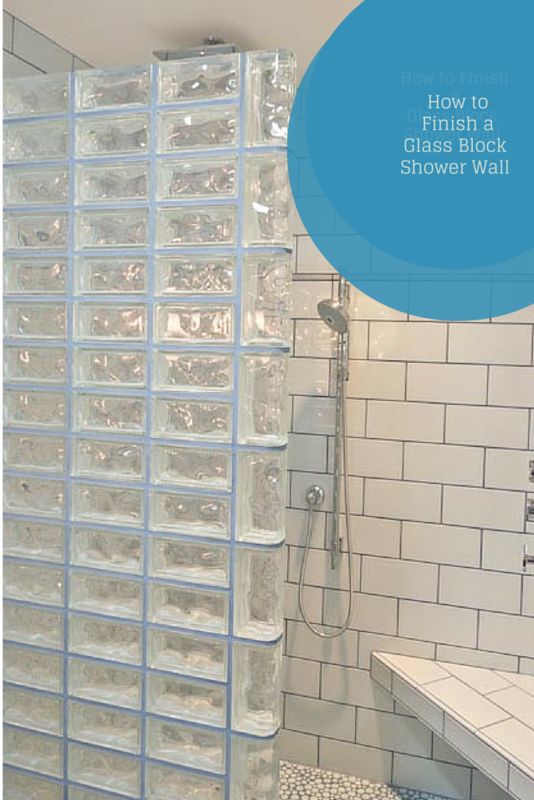 The question has come up repeatedly – what’s the best way to finish the end and top of my glass block shower wall? The answer – like many things in life is it depends. You may be saying right now, Mike what the H-E-double hockey sticks does it depend on? Well it depends on budget. It depends on the you want. It depends on how much you desperately want to blow up maintenance. It also depends on whether you have access to material supplier who know what the heck they’re talking about with glass blocks. Let’s look at the 5 most popular options for finishing these walls. At the end – you let me know which one looks the coolest to you. This option is by far the most popular finishing approach since it creates an “all glass” look and the bull-nosed edges of the finished glass blocks are easy to clean. These blocks come in 8 x 8 x 3, 6 x 8 x 4, and 8 x 8 x 4 sizes which provide a good degree of design flexibility (although since the 6 x 8 x 4 size was made by Pittsburgh Corning – which went out of business – they’re hard to find now). 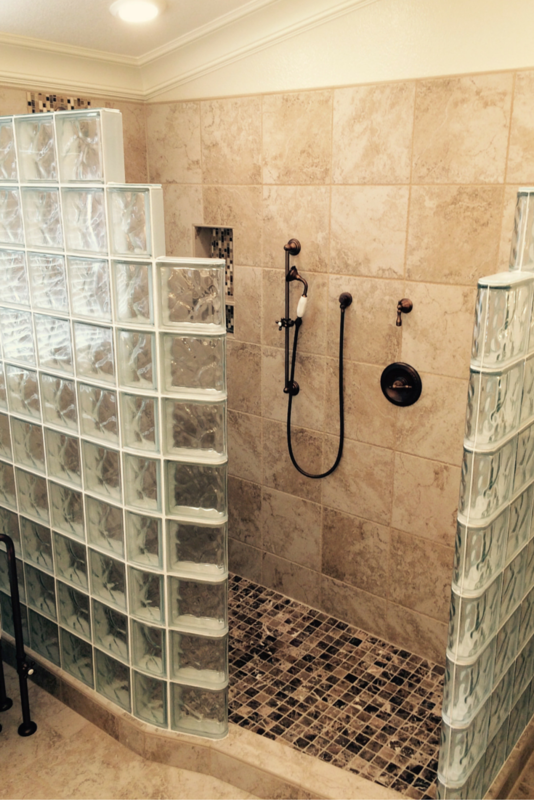 The double end glass blocks only come in 8 x 8 x 3 and 8 x 8 x 4 sizes (which requires walls which stair step down to be designed in 8” increments only – which can be limiting). So if you love the stair-step wall look you’ll need to remember you must work in 8″ sizes for both the horizontal and vertical measurements. The glass style caps are specifically made to fit over straight, curved, 45 or 90 degree angle glass blocks which make them a perfect option to finish the top of any wall (even if it’s radiused!). These glass caps (which are about 1/8” thick) are available in cool grey, snow white and biscuit colors. These units are adhered to the glass block wall with construction adhesive and are a very cost effective approach for the top of a wall. 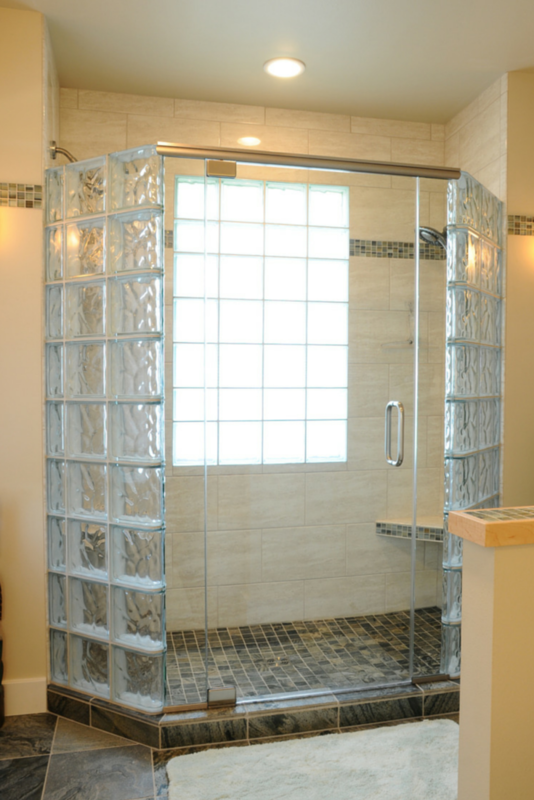 Their drawback is they don’t have an all glass block look and are not made to match other counter or trim materials in the bathroom. 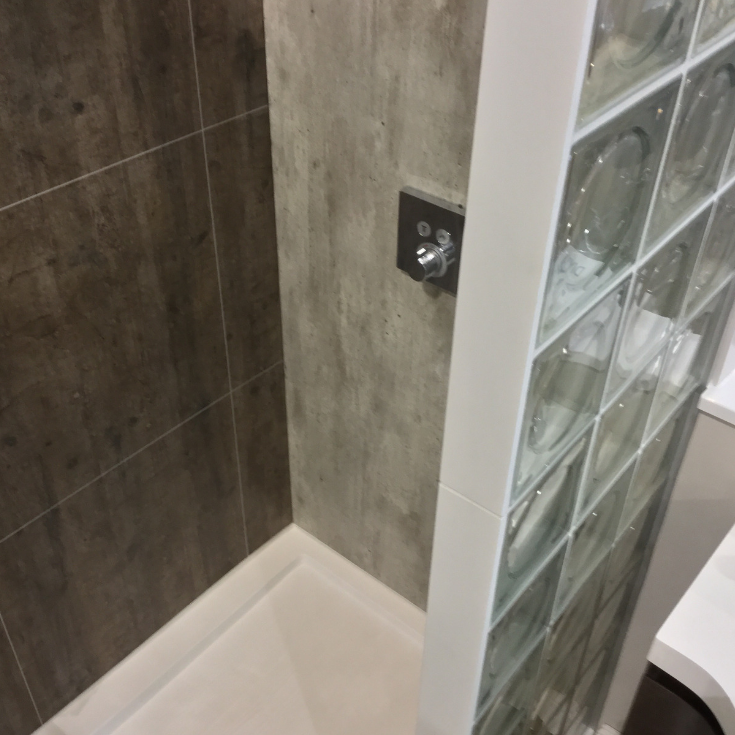 The most cost effective solution (which is only used for the top of a wall which is rarely seen) is to apply a thin coating of grout or mortar over the top surface of unfinished glass blocks. These is very cheap to do – but it is not the prettiest approach (but that may be OK if it’s not in view). These materials have long been known for their flexibility (they can be fabricated into almost any shape – straight, angled or curved), wide array of colors (which can be matched to bathroom countertops or other trim) and their ability to stand up to water. Their primary drawback (especially in the case of a curved wall) is they can be very pricey and their final design must be coordinated with the exact curvature of the block wall (this can be tricky if it is not done by someone knowledgeable). Note – if you don’t have a curved wall you can get these pieces for a reasonable price – especially if you talk to a cultured marble or granite supplier and ask about their remnants. 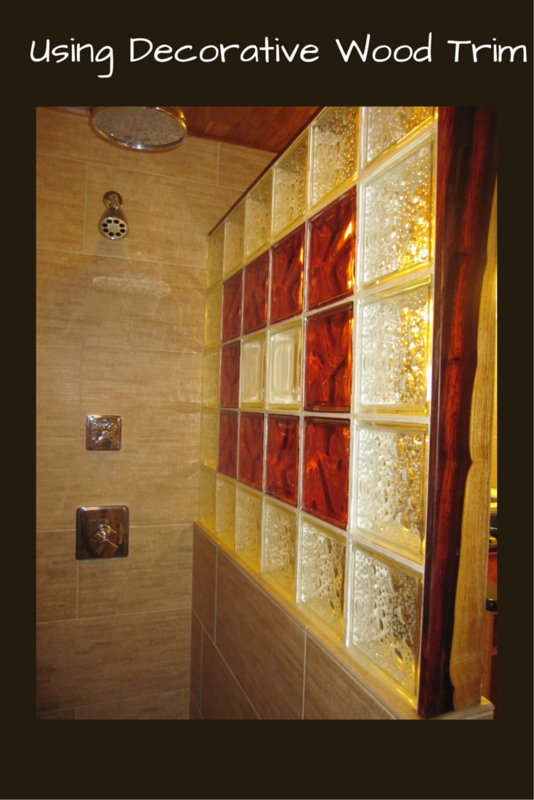 Option 5 – Decorative high density wood to finish the end of a shower wall – I bet you thought you’d never see this! OK so now some people probably think I’ve gone nuts to recommend using wood in a shower but there are several wood species (like teak, Brazilian walnut, and cocobolo pictured below) which are durable and applicable for wet environments. They can be cut to the desired shape and create a unique look. The drawback of high density wood is they are high priced, but boy are they cool to look at! Which of these 5 glass block finishing options do you like the best? If you’d like input on glass block finishing units or designing a glass block shower kit for your home call the numbers below. Call Innovate Building Solutions on a nationwide basis (877-668-5888) or for a local project their divisions including Columbus Glass Block (614-252-5888), Cleveland Glass Block (216-531-6363), West Side Glass Block (216-398-1020) or Mid America Glass Block (513-742-5900) of Cincinnati or Dayton and Akron (330-633-2900).